Calcutta, the so-called ‘cultural capital’, has demonstrated the increasing emptiness of the epithet, yet again. Taslima Nasreen, one of the most famous Bengali authors alive, had scripted a TV serial named ‘Doohshahobash’ (Difficult Cohabitations) portraying three sisters and their lives— standing up to kinds of unjust behaviour that are everyday realities for the lives of women in the subcontinent. Nasreen has long lent a powerful voice to some of the most private oppressions that women face, often silently. The private channel where the serial was slotted ran a vigorous and visible advertising campaign— Nasreen’s name still has serious pull among Bengalis and the channel knew it. Nasreen had made it clear that the serial had nothing to do with religion. However that was not enough for the self-appointed ‘leaders’ of the Muslims of West Bengal who issued warnings to the effect that the serial not be aired. The commencement of the serial, sure to be a hit and a commercial success for the channel, has now been postponed indefinitely. One can imagine the pressure the producers and broadcasters have faced that led to the shelving of a potential runaway commercial success. As in the recent incident of Salman Rushdie being prevented from coming to Calcutta due to the protest by similar characters, one can be sure of the role the Trinamool Congress government and its law enforcement agencies played in this affair. If the government is to be believed, it had no role in the criminal farce that is being played out unchecked. Muzzling free speech and right to expression does not always need written orders from the government. A phone call here, a verbal order there— these are typically enough. Nasreen has been living in New Delhi since 2007, after being hounded out of Calcutta by the CPI(M) led government on the instigation of Muslim groups threatening ‘unrest’. The pathetic reality of the lives of ordinary women in the subcontinent and the extraordinary oppression meted out to them, especially due to certain religious systems, have been the single most important theme of her writing. Steeped broadly and deeply in the cultural fabric of Bengal, the specific socio-geographical setting of much of her work is in the Muslim-majority nation-state of Bangladesh. Hence, in her earlier writings, Islam primarily represented the ugly face of religious majoritarianism. However, those who have cared to read her corpus, know very well that she has been an equal-opportunity truth-teller, castigating both Hindu and Muslim religious practices and ideologies. 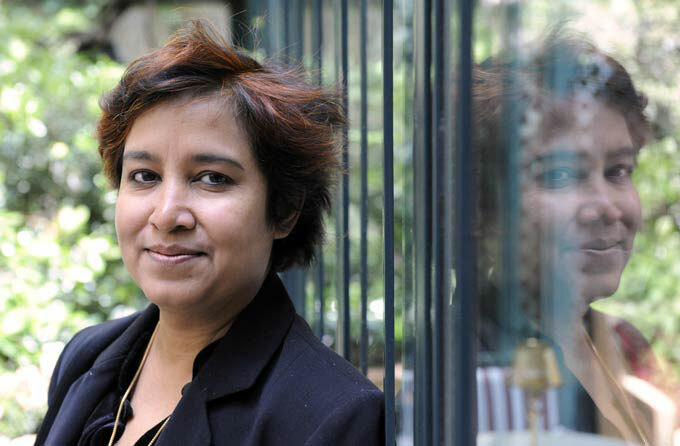 Taslima Nasreen is a daughter of the subcontinent. Islamists in Bangladesh wanted her head and made life miserable for her. After a few years in the West, she returned to West Bengal. I say ‘returned’ as it was an inalienable part of her cultural homeland. In Calcutta too, she lived in the face of constant death-threats. After her forcible ejection from Calcutta, she has never been allowed back, though she remains extremely interested in relocating back. One would think that the culture of issuing death-threats when one feels one’s religion has been slighted is alien to Bengal— which has, for centuries, epitomised religious syncretism as well as tolerance to so-called deviants of all hues. It is indeed sad that this alien culture of extremism, of relatively recent import, has managed to gain the upper-hand so as to force the government of the day to pander to these elements at a huge cost to the social and cultural fabric of West Bengal. Who exactly are these vocal opponents of Taslima Nasreen’s serial being shown publicly? Whenever one finds self-appointed spokespersons indulging in shrill rhetoric, it is useful to study their antecedents. Abdul Aziz of Milli Ittehad Parishad and Mohammad Quamruzzaman of the All Bengal Minority Youth Federation are two prime examples who have been extraordinarily active in running the Taslima-denunciation industry in West Bengal. Both these organizations share another distinction. They led a mass-meeting earlier this year in Calcutta protesting the punishment of Islamist leaders of Bangladesh who had directly committed crimes against humanity during the 1971 Bangladesh Liberation War. Thus those who defended rapists and mass murderers of 1971 (the victims were Bengalis, of whom a significant proportion were Muslims) have taken upon the mantle of community guardianship of Muslims in West Bengal. It cannot be clearer what kind of interest these folks represent. To even consider that such elements represent the interests of the Muslims of West Bengal is tantamount to insulting the intelligence and humanity of the community. 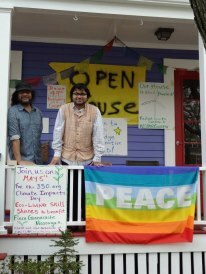 Calcutta’s intelligentsia and youth, once known to take to the streets and chant songs to protest the muzzling of Paul Robeson, a black-American singer and artist, has had nothing but silence to offer on this one. The current and the erstwhile rulers, the Trinamool Congress and the CPI(M) respectively, seem to be competing with each other in setting a record on muzzling free speech at the instigation of groups in whose worldview free speech has no place. While there may be short-term electoral gain for such posturing, this race to the bottom has no winners. The loser is the idea of a free and democratic society where dialogue and understanding is privileged over violence to ‘solve’ differences. In effect, such groups aspire for a society where there are no differences— no diversity of thought, expression, living and being. Nothing is more alien to the human condition than that. Gods only can help a society where governmental policy is dictated by sociopaths, unless a critical mass stands up to publicly state that enough is enough. Does the right to take —in this case assume —offence take precedence over the right to free speech? If yes, we are in sad and dark times. When insulting books, gods and other creatures has become the touchstone of ‘community leadership’, one might do well to remember the words of Kaji Nazrul Islam, the fiery poet of all of Bengal who is increasingly being packaged as a ‘Muslim’ poet—‘Manush enechhe grontho, grontho aneni manush kono’ (Man has produced books, no book has ever produced a man). There is nothing truer than man himself and free speech is a pre-condition for that truth to shine forth, in its myriad hues. Garga Chatterjee is a brain scientist at MIT.